Glartique’s uses innovative and creative solutions to integrate sockets into their bespoke art surfaces. 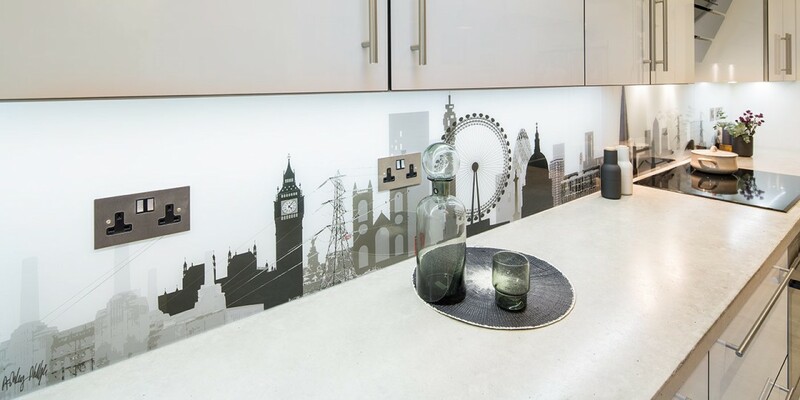 One of our clients wanted our ‘London skyline’ artwork as their splashback for their new kitchen but they did not want to move the plug sockets. We suggested the idea to integrate the sockets into the artwork and Ashley came up with some bespoke features to make the plug sockets part of the design. We added Battersea Power station with cables coming out of it going into the sockets and then out through some iconic electricity pylons to the next sockets, we also added some flocks of birds sitting along parts of the cables to inject some fun into a functional area. The client was delighted by our creative solutions giving us a 5 star review on Houzz.co.uk. Glartique transforming functional surfaces into Art.